Date: 20/07/10. Just another day at school. With more homework than ever before. Like The Blind Side, Crazy Heart is made worthwile thanks to an amazing performance from it's Oscar winning lead, in this case Jeff Bridges. 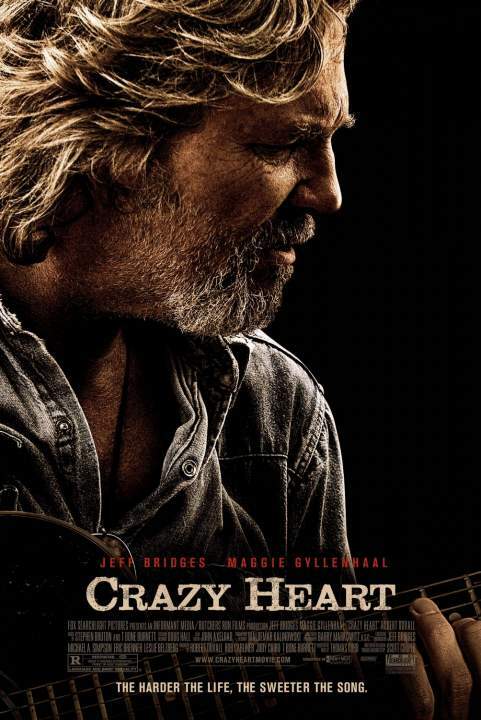 Sandra Bullock lifted the drivel of The Blind Side and Jeff Bridges did exactly the same for Crazy Heart. Had Jeff Bridges not been so great in this movie, it would have fallen flat on it's face, literally. Bad Blake (Jeff Bridges) was once a prized country singer, but has faded into the world oof working so hard for money but never getting very far. He meets a young single mother journalist, Jean Craddock (Maggie Gyllenhaal), who causes Blake to reassess what he wants to do with his life, while also inspiring him to reincarnate his career. This movie is a hard one to describe. I can see why it is so critically acclaimed, but for the more mainstream audience this is extremely American because of it's country music themes and also is very flat in the way of story. No to say that is a bad thing, because right from the very start I could tell this was mainly an acting showcase for Jeff Bridges and maybe also Maggie Gyllenhaal, who delivers a fantastic Oscar nominated performance. I admire it for it's beauty and slow pace which makes for quite an easy viewing. Also it's use of music which I guess will make country music fans smile. But, despite my best efforts, I became a little bored with it. Had it not been for Jeff Bridges who was captivating from start to finish, I may have been tempted to turn the movie off. A perfect Oscar film, with a fantastic performance from Bridges, but unfortunately lacks the magic factor. Very good assessment of Crazy Heart. Cheers!